Send flowers to celebrate a special day. This is a beautifully presented bouquet featuring a classic combination of flowers. 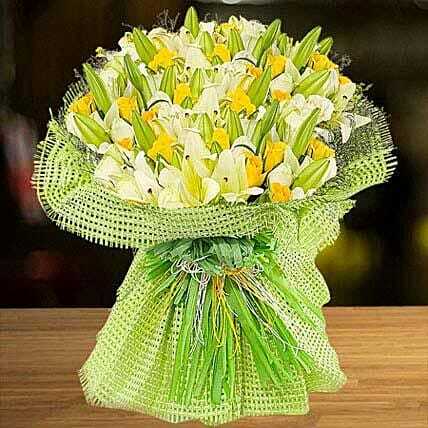 Gift the most beautiful rose flowers and Asiatic lilies in the classic and elegant style. The result is an impressive gift that is sure to make just the right impression. This flower bouquet is what is needed to make the joyous day so special. As these flowers blossom with every passing day, it reminds your loved one of you. ï¿½Flowers don't worry about how they're going to bloom. They just open up and turn toward the light and that makes them beautiful.ï¿½ Jim Carrey Meaning of flowers: White roses represent purity, innocence and humility, yellow roses are a symbol of cheerfulness and joy and lilies are a symbol of chastity and virtue.